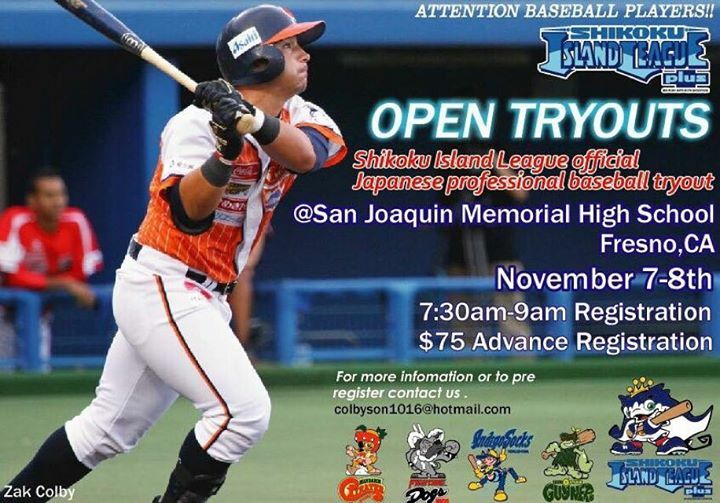 The Shikoku Island League Plus will be having open tryouts at San Joaquin Memorial High School in Fresno, California on November 7th and 8th. These tryouts are for players who are talented college seniors or players with professional experience who are looking to play independent baseball in Japan for the 2016 season. After the California tryout, there will also be another Japanese professional baseball tryout sponsored by the Puerto Rico Instructional Baseball League (PRIBL) held in Vero Beach, FL on November 10th. Here is your chance to play professional baseball in Japan! 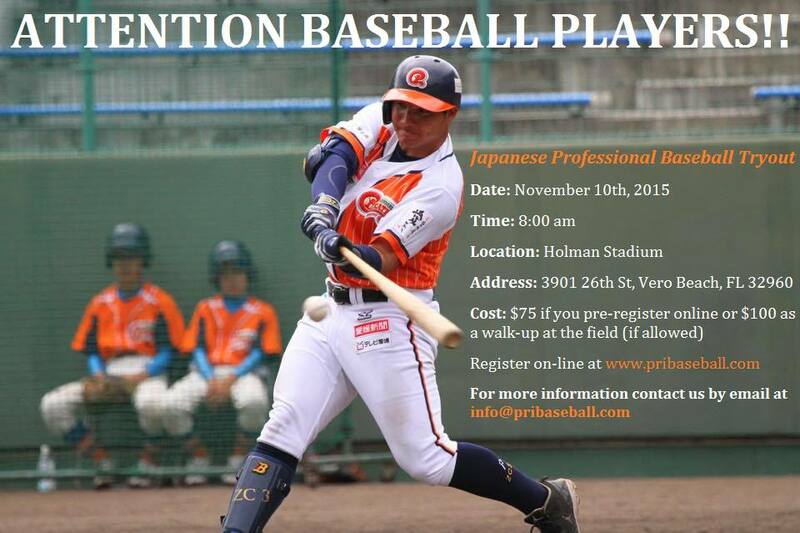 PRIBL is holding the 2015 Japanese Professional Baseball League Tryout in Florida, on November 10th. Some Japanese Scouts and Executives from Japanese Leagues will be present. This amazing opportunity is geared towards talented college players in their senior year and current professional baseball players from North America who are interested in playing professional baseball in Japan in the 2016. This tryout will be set up like the one in California and used to find players to fill any necessary holes that haven’t been filled yet. The GMs for the teams as well as the GM for the league will be at the tryouts ready to hand out contracts. Players in the Shikoku Island League Plus get paid between $1,500 – $2000 a month and stay in an apartment during the season. There is no age limit or any limit to the amount of “import” (non-Japanese) players a team can have on the roster. The level of play is comparable to MiLB Low A/High A and independent Frontier League with stadiums that are on the same level as some of the nicer Frontier and minor league stadiums here in the states. Players are well taken care of and really enjoy their time and experience playing baseball in Japan. The league plays from March (spring training) into mid-October (playoffs and championship series). Each season consists of 90 regular season games, roughly 70 games against other teams in the league and 20 against outside teams; however, all 90 games count towards the overall record. In addition to the Shikoku Island League Plus, the Route Inn Baseball Challenge League (BC League) is also in the Japan Independent Baseball League Organization. The BC League has been in existence since 2007 and was created as a spin-off of the Shikoku League after their great success. The BC League has eight teams and is similar to the Shikoku League in player salaries and playing conditions. Although those are the top two indy leagues in Japan, there is another independent baseball league – the Baseball First League. This league started in 2014 after taking the place of the Kansai Independent Baseball League which ran from 2008-2013. However, this league only runs three teams and doesn’t have as much prestige as the teams in the Japan Independent Baseball League Organization. As indy ball continues to grow in Japan, the leagues have become a way for players to move up to the Nippon Professional Baseball league (NPB). The NPB is the highest level of professional baseball in Japan with twelve teams split up in two six-team circuits. The playing level of the NPB is often called “AAAA”, meaning that it is better and more competitive than the minor league Triple A level but not as good as the MLB in America.